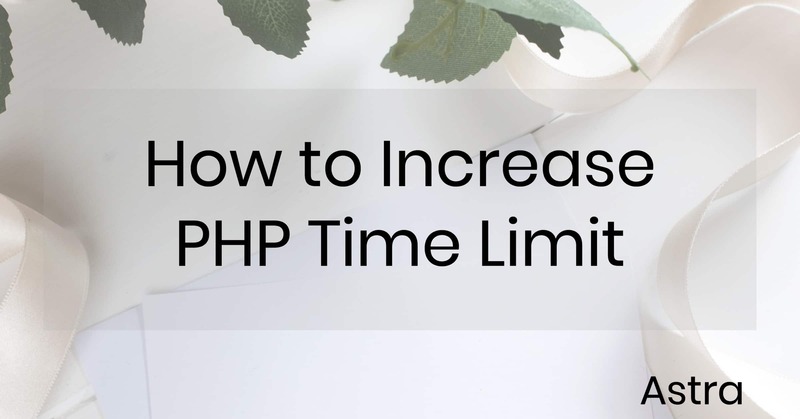 How to increase PHP Time Limit for WordPress sites? Docs » General » How to increase PHP Time Limit for WordPress sites? What Is The PHP Time Limit? The default value for PHP time limit on most hosts for the PHP Time Limit is 30 seconds. You can increase this limit by following any of the the methods mentioned below. Increasing the PHP Time Limit is complex and the process that differs from hosts to hosts. So it is always better to get it done from someone who knows it well. So just get in touch with your hosting company and they will be happy to do it for you. Some of you might have the .htaccess file where you can simply add / edit this line of code to increase the time limit. P.S: 300 in the above code samples mean 300 seconds. Feel free to change this to any appropriate number.